EarthHeart and its collaborators at the Green Star Movement have spent the last four and a half weeks replacing the old, peeling advertisements and graffiti on the 63rd and Wallace underpass with a very different kind of advertisement: a call for peace. At the center of the mural’s tessellations is EarthHeart’s logo, a red heart curled around a globe. Four doves—two blue, two purple—are spaced throughout alongside the words “peace, love, unity, and hope” in all caps. 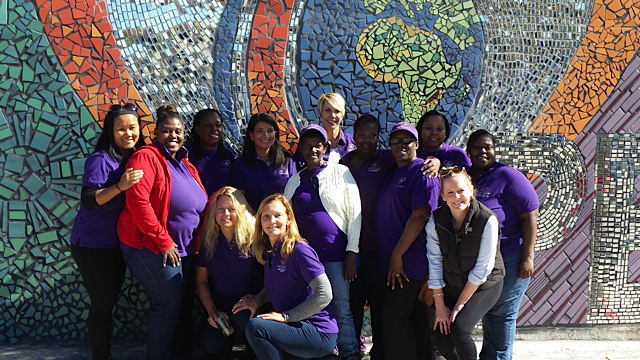 Diedre Koldyke founded EarthHeart in 2012 to mobilize the community of mothers in Woodlawn and Englewood as “change leaders and peace builders.” Koldyke imagined the mural as a “subliminal message” for passersby. Every part of the mural process united members of the Englewood and Woodlawn communities and beyond. EarthHeart raised $10,021 for the project on Kickstarter, and they chose the Wallace underpass because of its position as a bridge between Woodlawn and Englewood. Groups of kids from nearby schools volunteered with EarthHeart to install the finger-sized, quadrilateral tiles, which Green Star designed to withstand harsh Chicago winters. The Green Star Movement, which designs community art projects throughout Chicago, used mirror fragments for all of the words on the mural. Because volunteers were careful but not consistent with their placement, the tiles reflect sunlight in every direction. If the north side of the mural is inspirational, its south side is sublime. With precious few spindly black tiles set against an off-yellow background, the mural outlines a mother with her eyes reverently shut, stroking a sleeping child’s head. The mother and child are circumscribed by EarthHeart’s catchphrase, “Mother Ambassadors For Peace,” and a halo of reflective tiles. “I needed something nice to look at on the bus every day,” one Woodlawn mother explained. But many of the community members at the unveiling believed that the mural would also make a tangible impact on community interactions.